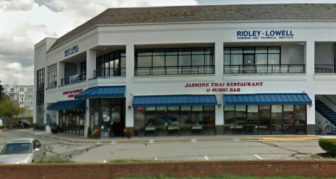 The Ridley-Lowell location in New London. The Education Department said it would offer the same help to the Ridley-Lowell students that it offered others who had enrolled in now-defunct for-profit schools like ITT Technical Institutes and Corinthian College Inc. Included in that help is the students’ ability to file claims that allow them to have most, or all, of their student loans discharged. Ridley-Lowell had two campuses in Connecticut, one in Danbury and another in New London. “The sudden and stunning decision by Ridley-Lowell Business & Technical Institute to close its campuses last week left Connecticut students with nowhere to turn – that’s why I called on the Department to act quickly to provide information and resources for students,” said Rep. Joe Courtney, D-2nd District. Courtney wrote Education Secretary Betsy DeVos a letter last week asking her to allow Ridley-Lowell students to discharge their loans. According to the Department of Education, in the 2008-2009 academic year, students at for-profit institutions represent 11 percent of all higher education students, 26 percent of all student loans and 43 percent of all loan defaulters. The median federal student loan debt carried by students earning associate degrees at for-profit institutions was $14,000. 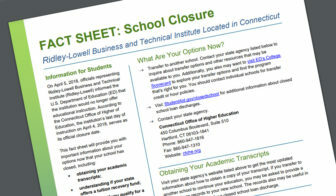 The Department of Education on Friday also provided “fact sheets” on its web site with instructions on how Ridley-Lowell students can obtain their transcripts and send them to another school. It also advised the students to apply for state tuition reimbursement programs. Connecticut has a program that could help Ridley-Lowell students who paid for their tuition, or part of their tuition, out of their own pockets. The school also has campuses in New York and Rhode Island. The Connecticut Department of Higher Education is also in the process of seizing student records at Ridley-Lowell so students can obtain transcripts through that agency. The department has also e-mailed the students a list of career schools and community colleges that have offered to work with Ridley-Lowell students to find a way they can finish their education. The fact sheet developed to help Connecticut Ridley-Lowell students. Weymouth also said the school was challenged because the U.S. Department of Education in December of 2016 withdrew its recognition of the Accrediting Council for Independent Colleges and Schools, the agency that accredited Ridley-Lowell. Without that recognition, schools can’t participate in federal student-aid programs. Schools like Ridley-Lowell were given 18 months to find another organization that would accredit them. As their time was running out, Washington, D.C., District Court Judge Reggie B. Walton threw these schools a lifeline. In late March, Walton remanded the decision by former Secretary of Education John King to strip the ACICS of recognition. Walton concluded the department had used a flawed process in removing the accreditor’s recognition. On April 3, DeVos ordered further review of the agency’s petition to keep its accreditation. “As the court ordered, we will fairly consider all of the facts presented and make an appropriate determination on ACICS’s petition,” DeVos said. The ACICS had accredited both ITT Technical Institute and Corinthian Colleges, which were forced to close after Obama administration regulators found that they were carrying out illegal recruitment tactics, misrepresenting their graduates’ success, and failing to adequately prepare their students for jobs in their respective fields of study. Sen. Richard Blumenthal, D-Conn., is among a group of Democratic senators who have written to DeVos asking her to release the documents being used by ACICS in its petition to keep its accreditation. “Given the ongoing lack of confidence we have in your department’s oversight of colleges and accreditors and the shaken faith of students and taxpayers in the accreditation system — as well as ACICS’ undisputed record of failure to carry out its responsibilities as a federally recognized accrediting agency — transparency in this case is of utmost importance,” the senators wrote.